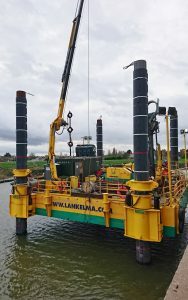 Lankelma’s C-5 Jack-Up Platform, known as Sandpiper, allows for geotechnical drilling, borehole investigation and CPT testing in waters up to 15m depth. The 18m by 12m platform is modular, allowing it to be transported by road, with the pontoons assembled on site using a simple coupling system. This makes it ideal for easy handling and assembly in remote locations, where conventional equipment cannot be used. The Sandpiper is able to undertake 24-hour operations, and is equipped with a Dando 9000 and 4000 drill rigs, Top push CPT rams and a Wison-APB wireline deployable CPT system.